Bellefonte was named by a French diplomat on a land-speculation visit to central PA in the 1790s. He named the crossroads "la belle fonte" for the natural spring -- "Big Spring" -- in town that provides the town its drinking water. Bellefonte’s Big Spring was awarded the "best tasting water in the state" by the Pennsylvania Rural Water Association. One of Coca Cola’s Dasani water divisions is sourced from Bellefonte’s Big Spring -- it’s that good. With many examples of Victorian architecture and a plethora of antique shops and boutiques to help you while away an afternoon, Bellefonte is just 12 miles from Penn State, and makes a neat little side trip if you're really not that into football! 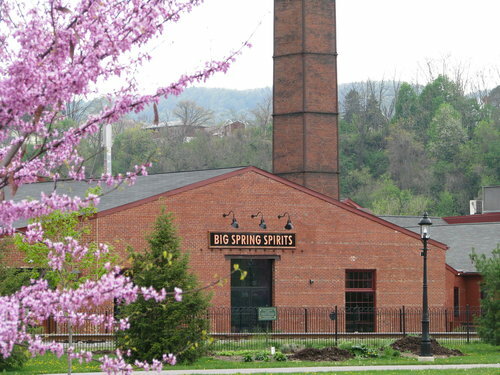 In addition, Bellefonte boasts having two stops on the Central PA Wine and Spirits Taste Trail: Big Spring Spirits and Good Intent Cidery. Start out at Cool Beans for a hot cup of joe and a breakfast roll or bagel -- you'll need the energy to shop! Then cross the street to Plaza Centre for three floors of antiques in an old theater building. Climb to the top of High Street, and turn right onto Allegheny Street, and you'll encounter several more amazing antique stores and quaint boutiques. Don't forget to check out the cute park at the foot of High Street! Around the corner from the park are two excellent stops for when you get thirsty: Big Spring Spirits, in the old matchstick factory building complex, and Good Intent Cidery! In fact, Bellefonte's big spring and its excellent water -- as good as or better than Kentucky's limestone filtered water -- made Bellefonte the perfect location for Big Spring Spirits. This boutique distillery offers a variety of gin, vodka, whiskey, and rum. One of the most intriguing tastings offered by Big Springs is tasting a white whiskey product next to the same product with some age. Many brown whiskey drinkers are unfamiliar with the process and this comparison is enlightening as to the impact of oak and time. Much of what brown whiskey drinkers enjoy most about the darker whiskeys are also present in the white whiskeys, but younger and less developed. Learn where the flavors of vanilla, baking spices and fruits start and how they mature. The distillery tasting room is comfortable whether you're there to relax with a few friends or try some new spirits! Hours: Contact Big Spring Spirits to ensure they're open.